Across America children start each school day by reciting the Pledge of Allegiance. It reminds them that the United States is “one nation under God.” The last stanza of Francis Scott Key’s “Star Spangled Banner,” written in 1814 and later adopted as America’s national anthem, similarly declares, “And this be our motto—‘In God is our trust.’” Government employees and military personnel respond “So help me God” when committing to uphold a code of conduct set forth by their country; and in the aftermath of the 9/11 attacks in 2001, the refrain “God Bless America” was heard often, as it recognized a source of strength for many of the nation’s stunned inhabitants. Other familiar phrases acknowledging and addressing the divine are found on government buildings and national monuments as well as in official documents and historic speeches. Although not unique to American society, routine references to a supreme Being are a touchstone of American thought. In general, Americans are not reluctant to proclaim reliance on God. From their frequent expressions it would seem that many consider the condition of their country and the well-being of its citizens to be somehow connected to their relationship with a divine Being. How did the use of this pithy phrase come about, and what does it mean to trust in God? Pollock came back with some suggestions, including “Our Country; Our God” and “God, Our Trust”; Chase requested that these be adapted to “Our God and Our Country” and “In God We Trust.” The latter was first imprinted on the new two-cent coin in 1864 and on most other coins by 1909. In 1957 it also began to appear on banknotes. “My own feeling in the matter is due to my very firm conviction that to put such a motto on coins, or to use it in any kindred manner, not only does no good, but does positive harm, and is in effect irreverence, which comes dangerously close to sacrilege. . . .
Congress nevertheless ordered that the motto be imprinted on the gold coins beginning in 1908. In the early 1950s, after the Soviet Union had successfully tested an atomic weapon, the Cold War escalated; many perceived the heightened fear of potential nuclear holocaust as a battle between godless communism and God-fearing America. Once again religious sentiment played a significant role as the United States House of Representatives introduced a resolution to adopt the phrase as America’s national motto. On July 30, 1956, U.S. president Dwight Eisenhower signed into law that congressional resolution. And as recently as November 1, 2011, the House of Representatives voted 396–9 to reaffirm the national motto and encourage its display in all public schools and government buildings. But is the slogan meaningful, or is it just a convenient cliché? Does America trust in God? Ironically, even while broadly affirming the motto, our current concept of tolerance and political correctness often results in lawsuits and court decisions requiring the removal of references to God in establishments ranging from the classroom to the courtroom. In countries where only one religion is allowed, professing allegiance to God can be required by dictate. However, in a democratic society that emphasizes freedom, choice, individualism and diversity, can the motto speak for the nation? Surveys continue to find that most Americans profess belief in God. But whose understanding of God these citizens believe in or might agree to trust is another matter altogether. In considering the implications of “In God We Trust,” we will inevitably confront a number of questions: Could the motto be misconstrued to suggest that God supports the efforts (whatever they may be) of those who claim His allegiance? Are people justified in believing that their perspective is right and assuming that God is behind it? Is God required to back the plans and policies of those who profess confidence in Him? People devise plans, but who knows what tomorrow will bring (James 4:13–15)? A person’s sincerity and determination in making those plans does not obligate God. The prophet Isaiah advised caution before concluding that our will coincides with our Creator’s and has divine support: “‘For My thoughts are not your thoughts, nor are your ways My ways,’ says the Lord. ‘For as the heavens are higher than the earth, so are My ways higher than your ways, and My thoughts than your thoughts’”; “Seek the Lord while He may be found, call upon Him while He is near” (Isaiah 55:8–9, 6). “In God We Trust” has been the subject of numerous court challenges on the part of those who feel it violates the separation of church and state. It has survived, however, and even got a mention in a seminal 1984 Supreme Court decision; one of the justices noted that the motto is best understood as a “ceremonial deism,” having “lost through rote repetition any significant religious content.” Its use is thus viewed today as mere nonreligious ritual. Jesus Himself warned His followers about the trap of “vain repetitions,” which can drain all the substance from concepts that should be deeply meaningful (Matthew 6:7). 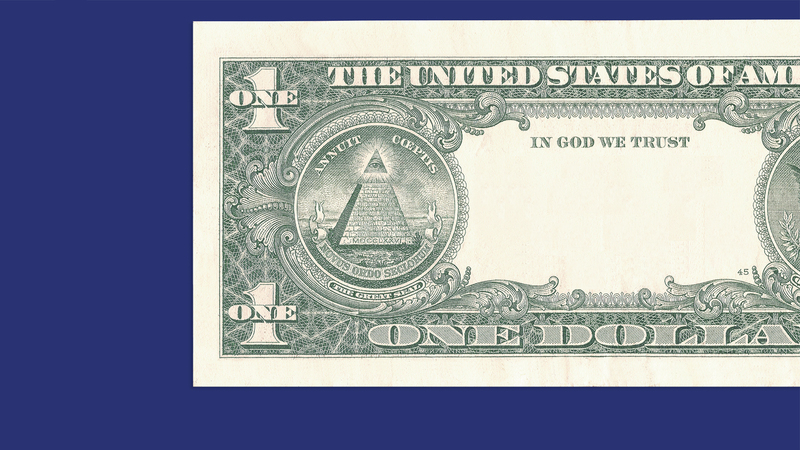 Even though the courts have declared “In God We Trust” essentially void of meaning, many sincere Americans still attribute considerable religious and patriotic significance to the motto. But has the concept of trust in a supreme Being morphed into a syncretism of various interests—a curious conglomeration of religion and patriotism? Is this “trust” really just pride in democratic self-determinism and capitalism? Could it be that the God in which Americans trust is America itself, its governmental and economic systems? Emilio Gentile, professor of contemporary history at the University of Rome “La Sapienza,”declares, “The American civil religion is the first historical example of a religion of politics in the modern era. . . . A religion of politics is created every time a political entity such as a nation, state, race, class, party or movement is transformed into a sacred entity, which means it becomes transcendent, unchallengeable, and intangible. As such, it becomes the core of an elaborate system of beliefs, myths, values, commandments, rituals, and symbols, and consequently an object of faith, reverence, veneration, loyalty, and devotion, for which, if necessary, people are willing to sacrifice their lives” (Politics as Religion, Gentile’s emphasis). With that “something for everyone” approach, it’s easy to see how religion can remain such a significant part of American culture. But if it’s everyone for himself, where is the basis for real meaning in those things that are, at least nominally, held in common? Does “In God We Trust” have any meaning? The Bible reveals that the use of God’s name comes with a certain responsibility (Deuteronomy 5:11). Trust in God involves a sincere effort that engages one’s heart and mind. Ceremonial and patriotic slogans fall short of the biblical criteria for trust in God. During His earthly ministry, Jesus identified an ironic disconnect between words and actions on the part of many who call on God (Matthew 7:21; Luke 6:46). These scriptures demonstrate that God does not belong to those who merely co-opt His name. Trust cannot be mandated by motto; rather it requires an individual act of volition, a conscious, willing choice on where to place one’s confidence. Those who truly put their trust in God will both acknowledge Him and seek His ways (Proverbs 3:5–8). PBS, God in America (2010). U.S. Supreme Court, Lynch v. Donnelly, 465 U.S. 668 (1984).